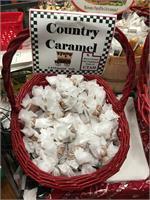 We are famous for our wonderful OLD WORLD STYLE SWEET CREAM CARAMEL. Our secret recipe is . . . MELT-IN-YOUR-MOUTH . . . JUST-HOW-YOU-LIKE-IT . . . WITH HEAVY WHIP CREAM caramel. It tastes just like the caramel Grandma used to make. We don't use preservatives or artificial flavorings and colorings. IT'S YUM! YUM! YUMMY! 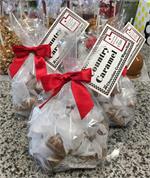 Our caramel was featured on the FOODNETWORK and the TRAVEL CHANNEL. 1 lb. gift bag of Country Caramel. 1/2 lb. gift bag of Country Caramel. 2 lb. gift bag of Country Caramel. Buy our Country Caramel by the pound.